Mark William Davis (born October 19, 1960 in Livermore, California) is a former pitcher in Major League Baseball. He won the Cy Young Award in 1989 as a relief pitcher for the San Diego Padres. From 1980 through 1997, he played for the Philadelphia Phillies (1980–81, 1993), San Francisco Giants (1983–1987), Padres (1987–1989, 1993–1994), Kansas City Royals (1990–92), Atlanta Braves (1992) and Milwaukee Brewers (1997). Davis batted and threw left-handed. He was currently the Minor League Pitching Coordinator for the Kansas City Royals organization, but stepped aside after the 2011 season and will coach a single short-season affiliate in 2012. Davis began his career in 1980 with the Philadelphia Phillies, and spent parts of five seasons with the San Francisco Giants. He started a career-high 27 games in 1984 for a 5–17 win–loss record. He became a primary reliever the following season, but he did not establish himself as a top reliever until being traded to San Diego during the 1987 midseason. In 1988, Davis became the Padres' closer, earning 28 saves and 44 in 1989, appearing in the All-Star Game in both seasons. He was a Cy Young Award winner in 1989 after a 1.85 ERA and 65 games finished in addition to his league-leading save total. In the last month of the season, he pitched 25 innings and did not allow any of the 19 runners he inherited to score. He was the fourth closer so honored in Award history. No closer would win the NL Cy Young again until Éric Gagné in 2003. 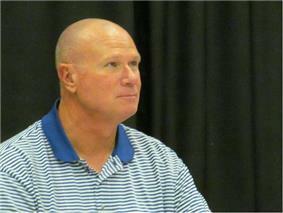 Davis signed as a free agent for $10 million with the Kansas City Royals before the 1990 season. He pitched ineffectively early in the season and subsequently lost the closer role to Jeff Montgomery. After a brief stint for the Atlanta Braves in 1992, again he pitched with the Phillies and Padres from 1993–1994. After going out for two years, he returned to pitch until retiring with the Milwaukee Brewers in 1997. He never came close to matching his accomplishments for San Diego, earning only eleven saves over the last eight seasons of his career. In a 15-season career, Davis posted a 51–84 record with a 4.17 ERA and 96 saves in 624 games pitched. Davis spent three seasons on the Arizona Diamondbacks staff, as bullpen coach in 2003–2004, and pitching coach in 2005. From 2006 to 2010, Davis was the pitching coach for the Arizona League Royals. In October 2010, he was promoted by the Kansas City Royals to Minor League Pitching Coordinator. Davis currently lives in Scottsdale, Arizona with Candy, his wife. They have four children (two sons and two daughters). ^ "Arizona Diamondbacks Managers and Coaches". baseball-reference.com. sports-reference.com. Retrieved November 26, 2014. ^ a b "Royals name Tony Tijerina Minor League Field Coordinator and Mark Davis Minor League Pitching Coordinator". Kansas City Royals. mlb.com. October 28, 2010. Retrieved November 26, 2014.